Dates, otherwise known as the fruits of paradise, certainly live up to their reputation. I’ve always had a passion for this sticky fruit, mostly because my mother loves them so much. We always had dates at home, as well as almonds. Eating them together is so pleasurable, especially with a hot drink to warm up the palate. I recently read about all the benefits of dates, and was amazed to see that they are renowned to uplift your mood and cure mild winter blues. I couldn’t wait to make a date and almond cake, and added two of my favourite ingredients – orange blossom water and a shot of espresso. So nutritious, delicious and such a hit! I wanted to bake it in a bundt cake pan to give it an old-fashioned twist along with the dripping salted caramel glaze. Everybody loved it. I highly recommend serving this cake with a cup of hot almond milk, a drink I love ordering in Chinese cafés. You can find this drink at Asian supermarkets, or in health food stores. Preheat the oven to 180°C/350°F. I used a bundt cake pan (you can use any type of pans you wish). Chop dates coarsely, place in a saucepan add water and the shot of espresso (or instant coffee + one tbsp water). Bring to a boil, remove from heat and add bicarbonate of soda. Let it fizz for a few minutes and mix well. Set aside. Chop almonds coarsely, place in a small bowl and pour the orange blossom water. Leave to soak for 15 minutes. In a large bowl, cream butter and sugar until light and fluffy (you can use electric whisks). Add sifted flour, eggs (one at a time), mix well until batter is creamy. Stir in the date mixture and chopped almonds and the orange blossom water. Spread butter generously around sides, bottom and into crevices of the cake pan. Pour batter into the buttered cake pan and bake for 40 minutes, or until a cake tester inserted in the center of the cake comes out clean. Leave to cool on a wire rack for 10 minutes before unmolding. In a saucepan, melt the salted butter, brown sugar, cream and bring to a full boil. Lower heat, stir constantly for two minutes, then set aside and leave to rest for a few minutes. Whisk in sifted icing sugar gradually until you get the desired consistency. You should be able to pour the glaze on the cake so the sauce should not be too thick. Pour glaze all over the top of the cake. Let the glaze set before serving (a few minutes should do). The cake sounds lovely, and very similar to one I used to make quite often. What size bundt pan did you use for the cake? I’m asking because the cake appears to be quite small in the photo when compared to the size of the dates. I think a slice of cake with a nice cup of tea would make a lovely addition to this rainy weekend. Do you have a photo of the beetle because of color similarities? Just curious. This sounds divine. Very unusual and all of the ingredients are native to California. Will try soon. Thanks. Comme c’est beau …. et certainement très bon aussi. The combination of flavors in this sounds intoxicating. And I love the homey-ness of the bundt, can’t wait to give this one a try! This looks delicious! I looove dates. Do you think I would need to adjust the baking time if I used a regular round cake pan? 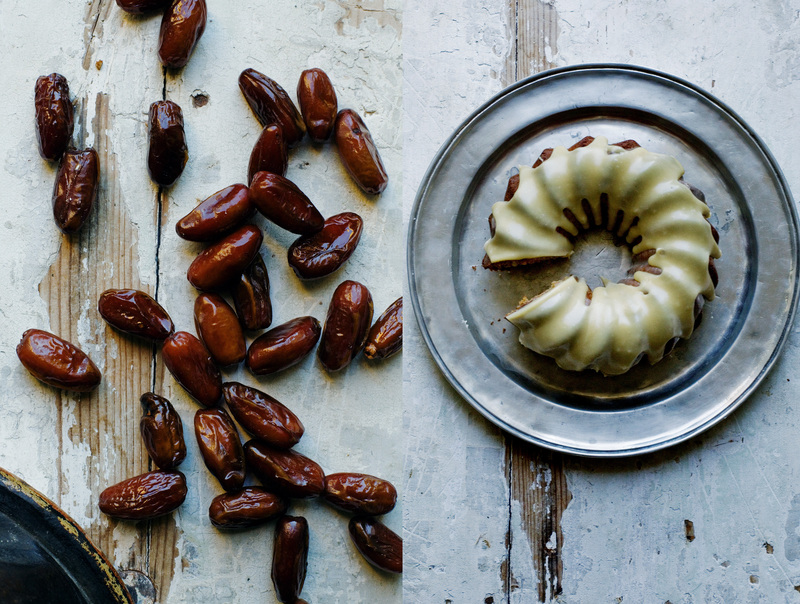 So happy to have this recipe for dates…they are a source of sustenace for my family, especially during ramadan! we also make a pilau with them, several types of desserts with dates, flour, oil, rose water, and saffron (but this is very concentrated), even mix them in with eggs fried in butter for high energy breakfast on a cold day! But never have tried them in a cake, can’t wait to do this…a wonderful marriage of ingrediants! This cake is delicious. The flavor combination is really stellar. Apprehensive initially because of the acidic brashness of instant coffee, though the flavors harmonize well. I didn’t have nearly that many dates, worked out alright with less and ground some high-protein wheat berries for the flour to make it between bread and cake. I am really impressed with the flavor combinations that you develop in the recipes online and look forward to more of your recipes Mimi, possibly in your book? Thank you. I have a suggestion for a second career for you: Provencal real-estate revitalizer extraordinaire. There are so many lovely properties in France and Spain, you do Medoc justice. Seems to be so good. I will make it, for sure. I tried this cake last night…..it’s the best cake I’ve ever made in my life…very cool recipe…thank you for sharing!! Il a l’air délicieux! J’aimerais le faire pour des invités dont une intolérante au gluten, pensez-vous que je puisse remplacer la farine de blé par de la farine d’amandes? Si oui, des modifications au niveau de la levure? D’avance, merci! Rebonjour, juste pour vous signaler que si le sel apparaît dans les ingredients, vous avez oublié d’indiquer de l’ajouter dans la recette.